There are so many ways to lock and unlock Android devices that I feel like the situation is getting out of hand. I have already shown you how to lock your phone with a variety of options including gesture controls and built-in security measures. Today, I will show you exactly how to allow your phone to be unlocked via OK Google so screaming at your device will actually do something. Before you can actually enable the option, there are several settings you have to go through first. Follow each of the steps outlined here closely in order to ensure that everything has been set up properly otherwise the command may not work. Also note that for this method to work, Google’s personal assistant needs to be enabled at all times. This may result in a hit to your battery and, of course, your privacy as the device will continue gather information about surrounding sound. Google has rolled out a feature called “Trusted Voice” in many devices as part of its wider “Smart Lock” program which enables alternative security tools for Android users. 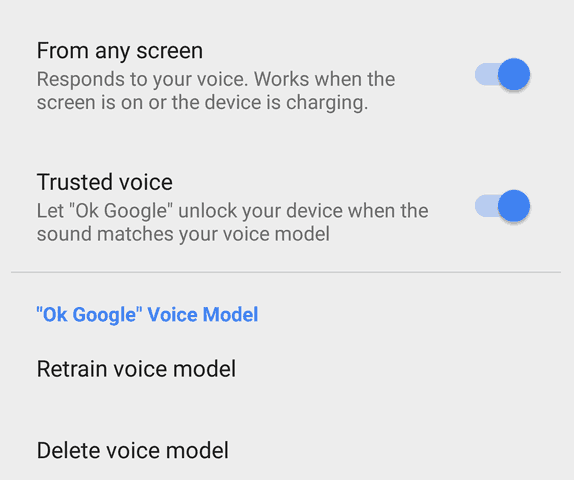 One of those tools uses your own voice to unlock the phone but there are two different ways to access it, depending on your version of Android and your manufacturer. 1. Open the Settings in your Android device. If you already have a screen lock enabled, continue to the next step. Otherwise, go to the Security menu and enable one now, preferably a password or PIN. 2. Go to “Language & input” and then open the “Voice input” menu. 3. If the “Enhanced Google services” option is already selected, continue on to the next step. If not, tap on it, read the pop-up message informing you about Google’s services and then confirm it to move on. 4. Tap on the gear icon next to the “Enhanced Google services” to open its settings. 5. Open the “OK Google” detection menu. 6. Turn on the toggle for the From any screen option. This will take you to a setup wizard so tap on the “Get Started” button to continue. 7. You will need to say “OK Google” three times in a row so that the system can get familiar with your voice. The feature will further improve over time but this initial setup is necessary anyway. Once you have said the keyword three times, tap on “Finish” to get back to the previous page. 8. The toggle for Trusted voice should now be available. Turn it on and enter your password/PIN. Confirm the pop-up once again and you are pretty much done. 9. To unlock your phone with your voice, you have to say two separate commands. First you must say “OK Google” in order to activate the digital assistant. Then, saying “unlock my phone” or “unlock phone” or something to that effect will allow the personal assistant to actually unlock your device. This is a more straightforward option but not a lot changes after the initial setup. 1. A screen lock is required for this method too so make sure to enable it before going further. Once that is ready, return to the Security menu, go to Smart Lock and enter your password/PIN. Should the option be missing, double-check that Google Play Services are updated and that the Smart Lock item is enabled in Security > Trusted agents. 2. Once you are inside the Smart Lock menu, tap on the “Trusted voice” item and you will be taken to the same menu we talked about this before. This method simply enables you to access additional security options quickly so you may want to get familiar with the Smart Lock menu in general.